Scientists from the CSE Corporation (a company developing cutting-edge gas detection devices used in air-quality monitoring) and Aspect remediation engineers are working in partnership to develop new methods for continuous methane-gas monitoring at landfills. 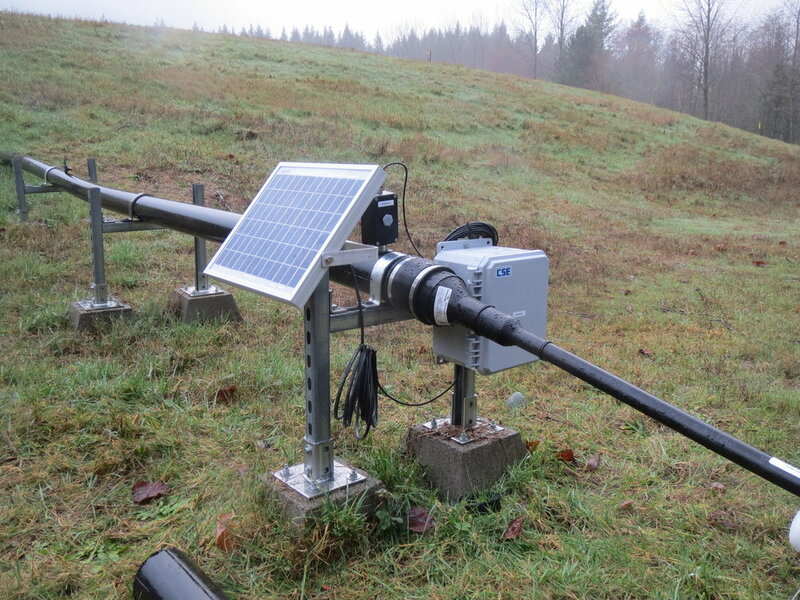 CSE’s methane-gas monitoring products use solar-powered instruments outfitted with telemetry. Solar power eliminates the need for frequent battery replacement while telemetry allows remote monitoring of the data. With cooperation from King County Solid Waste Division, CSE has provided Aspect with test units to install at several of the County’s closed landfills to gauge the effectiveness of this technology for the landfill industry. CSE has roots in the mining industry and a history of innovations, including the first self-contained rescue-breathing apparatus for use by mine personnel. KCSWD, Aspect, and CSE are testing the devices ability to monitor methane, a primary source of greenhouse gas emissions from landfills. Got methane? CSE remote methane monitoring setup with telemetry and solar panel on a passive landfill gas collection system in King County, Washington. Aspect’s Peter Bannister, along with King County’s Dan Swope, will co-present at the 2016 Solid Waste Association of North America (SWANA) Northwest Regional Symposium in Vancouver, BC on Friday April 8th. As landfills age and landfill gas generation inevitably declines, landfill operators face the problem of using legacy collection and control systems that weren’t designed to harvest dwindling amounts of landfill gas. Simply continuing operation of these oversized systems is often not practical or financially prudent. Peter and Dan will present the Enumclaw Landfill case-study and focus on how landfill gas forensics has proven to be an innovative solution to coaxing better performance out of existing landfill gas collection and control systems, and designing downscaled systems, at closed landfills in King County, Washington State. Peter and Dan will present Friday morning at 10:30AM in technical session 6B – Advances in Landfill Gas Management. Learn more about the conference HERE and view the agenda HERE.